Make hot-weather fans with a handle made from a wooden stick. Attach to string or clear thread and hang from the ceiling or several along a ribbon for party decorations. 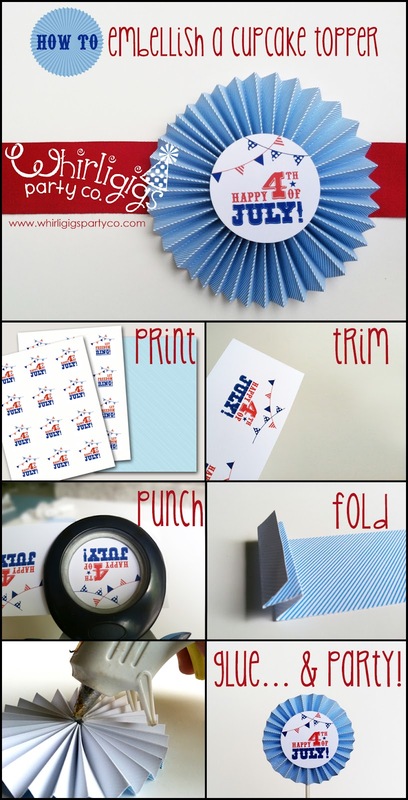 Arrange a cluster of the patriotic fans on top of a cake or in a glass jar as a center piece. 1. 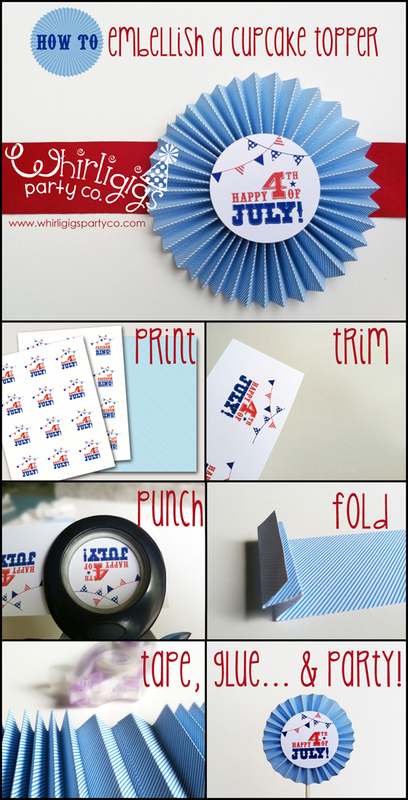 Download these FREE cupcake toppers and blue stripe pattern sheet. 2. Print 2" circle rounds and fan pattern sheet on your color printer or at a copy or office supply shop. For each sheet of circles you will need to print 5 copies of the blue stripe pattern. 3. Trim the 2" rounds into three strips, according to dotted line guidelines so they easily fit in your paper punch. 4. Trim the blue stripe sheet into 10.75" x 1.5" strips. 5. Punch with a 2" paper punch, centering the image in the circle shape of your punch.If you don't have a punch, print and trace this 2" circle shape onto your cupcake topper and cut with scissors. 6. Fold your pattern sheet accordion style at 3/8" increments, making sharp creases with the back of your fingernail or a bone folder. 7. Adhere the ends of two accordion-folded strips together with a double-stick tape or a glue stick. 8. Tape end-to-end using the double stick tape to create your circular fan. 9. Optional: Add a dab of hot glue to the hole in the backside for enforcement. 11. Adhere your 2" circle to the front of the fan using double stick tape or glue stick.